Every time we drive through Sherwood Forrest Dotty marvels at the size and shape of the Banyan trees. 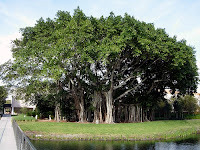 The Banyan trees are about 60 feet tall. Maybe taller. I would estimate that Dotty has seen the same exact trees over 7,000 times. But now, each time its for the first time. Five years ago it would be unsettling to me when Dotty would start talking about those trees. She would marvel, look at those trees. Look how big they are. I can't believe it. I have never seen so many trees. What did I do? I would remind Dotty that she had seen those trees thousands of times. It was somehow important for me to remind her. Of course, this would sometimes cause Dotty to become confused. It might even cause her to tell me that I was full of poop. Her words were not kind. 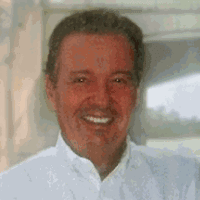 Eventually, I made my way into Alzheimer's World. After I made it into the World I started looking at things from Dotty's point of view. Why should I be upset if she asked me what day it was ten times? If she needed to know what day it was, she needed to know. After all, don't we all need to know what day it is? How would you know where to be, or where to go, or what to do if you never knew what day it was? Once I made it to Alzheimer's World, I started to look at the world from Dotty's point of view. I tried to think and feel like she was thinking and feeling. I often asked myself, why? Why is she acting this way? Why is she feeling this way? I also stopped making it all about me. Instead, I made it about Dotty, and about us. I stopped complaining and saying, can you believe she does this, and she does that. I replaced words like she, me, and you, with words like we and us. Once into Alzheimer's World, I started listening to Dotty. The sound of her voice. What was I hearing? Confusion? Anger? Happiness? Joy? I listened. Today when Dotty starts marveling at the size or the number of trees, I'll be listening to her voice. I'll hear how amazed she is. How happy she sounds. I'll listen to her words. I'll feel happy. I'll also notice that those banyan trees are big and beautiful. Amazing looking in fact. Each and every time if you pay attention. Way back when, when Dotty would act like she never saw those trees before in her life I would get sad. I would need to remind her she had seen them thousands of times. I was burdened. Now, I listen to Dotty's sweet voice. Hear how really amazed she is feeling. It makes me feel happy. We get along better these days. I finally learned to look at the trees.